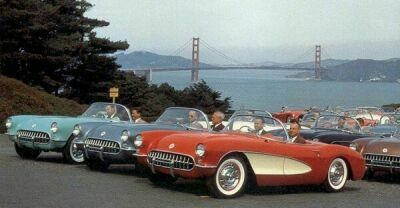 The Chevrolet Corvette first appeared in 1953 as a unique American entry into the sports car market dominated by European makes. Although not a muscle car by definition, the Corvette used muscle car powertrains and has represented American performance for almost fifty years. Comments: The first Corvette rolled off a makeshift assembly line in Flint Michigan on June 30, 1953, a mere six months after the debut of the concept car at the GM Motorama. From the beginning, the Corvette was unique. It was only available as a two passenger convertible in Polo White with a red interior. 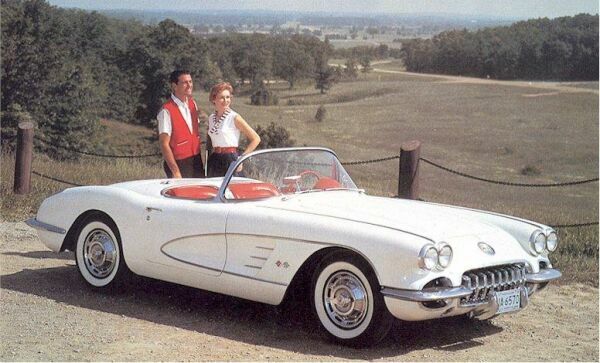 All Corvettes were built by hand and its attractive and original body was constructed out of fiberglass, not steel. Its chassis, with a 102 inch wheelbase, was basically a shortened Chevy passenger car unit. The only engine available was named the Blue Flame Special and was an upgraded version of the 235 cid six found in other Chevy cars. It produced 150 bhp due to the use of a higher lift cam which provided a significant boost in torque in the mid-range of engine speed. The valves were special alloy steel and fitted with double springs. The engine also featured a 8.0:1 compression ratio and triple Carter downdraft carburetors on a cast aluminum intake manifold. A dual exhaust was installed. The only transmission was Chevrolet’s Powerglide two-speed automatic. Although the powertrain was a departure from typical American straight-line performance, coupled with its light weight, the Corvette boasted excellent handling and road feel. The Corvette’s front suspension of coil springs and wishbones, used slightly altered springs enclosing one inch diameter tubular shock absorbers. The Corvette also had a large diameter anti-roll bar and at the rear, had four-leaf semi-elliptical springs which were inclined front to rear to provide approximately 15 percent roll understeer. Only two Regular Production Options (RPOs) were available, a heater and an AM radio. 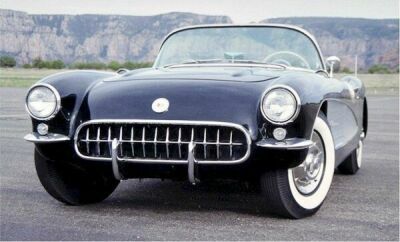 Exterior styling was done by Harley Earl and featured a toothy grille, stone guards over the inseft headlamps, “twin pod” rear fenders, and “rocket ship” taillights. The first Corvette was a sales disaster as its high price (more than a Cadillac or Jaguar) and low performance made it far from desirable. A mere 183 were sold in 1953 out of 300 built. 235 (3×1 bbl) I6 150 bhp @ 4200 rpm, 223 lb-ft @ 2400 rpm. Comments: Exterior color choices expanded for 1954 with the addition of black, blue and red to the existing white. A new beige interior was also available. The Powerglide two-speed automatic transmission was still the only transmission available, even though it was technically listed as a $178 option. Sales climbed to 3,640 units in 1954. 235/150: 0-60 in 11.2 seconds. Comments: Sales fell to just 700 units in 1955, leading to a push within GM to kill the Corvette. However, Zora Arkus-Duntov, an engineer on the Corvette team since 1953 and a former European road racer, was determined to save the Corvette and make it a contender. He started by giving the Corvette the two things it needed the most, more power and better handling. By mid-1955, more power was added with the addition of a 265 cid V8 rated at 195 bhp as well as the option of a 3-speed manual transmission. Meanwhile, Duntov drove a prototype V8 powered Corvette to a new record in the Daytona “Measured Mile” at just over 150 mph which gained some much needed recognition for the Corvette. The Corvette was officially saved and Duntov would be remember as the “grandfather of the Corvette” for his efforts. 265 (4 bbl) V8 195 bhp @ 5000 rpm. 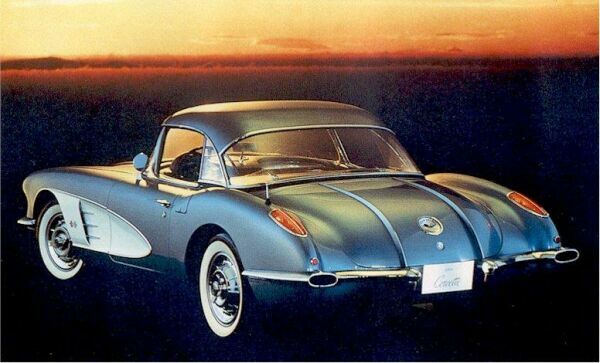 Comments: The Corvette received its first major styling change in 1956. Changes included an all-new body with better integrated styling featuring “scooped out” sides, outside door handles, roll-up windows and an optional removable hardtop. The 6 cylinder engine was dropped and the 265 cid V8 was now standard, though it was still rated at just 195 bhp. 265 (4 bbl) V8 210 bhp. 265 (2×4 bbl) V8 225 bhp. 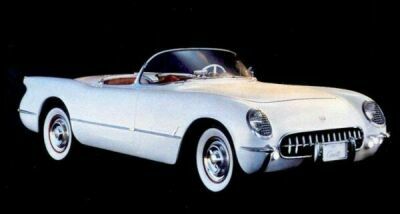 Comments: Chevrolet finally got their sports car right for 1957, as the 1957 Corvette finally gained power to go along with its outstanding styling and road feel. 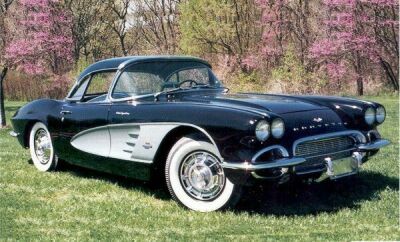 Many Corvette enthusiasts consider the 1957 Corvette was the most aesthetically pleasing body style of the pre-1963 Corvettes, while others believe that it was the best styling of all time. 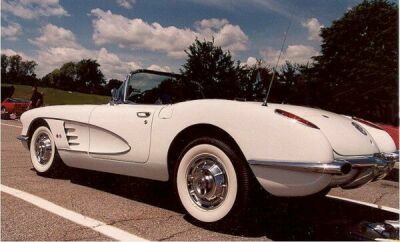 And backing up that beautiful styling was the Corvette’s first true powerful engine, a 283 cid V8. A bored out version of the 1956 265 cid V8, the new 283 cid V8 came in four versions. The base form had a four-barrel carb and was rated at 220 bhp. Next came an early fuel injected version rated at 250 bhp and then the dual four-barrel carb 283 rated at 270 bhp. But late in the model year, in May 1957, the true performance version of the 283 made its debut. Sporting an advanced fuel injection system, the new “fuelie” 283 made 283 bhp. Its 1 horsepower per cubic inch output was a record in 1957 and it was played up by the advertising and media. At the same time, Chevrolet introduced its new four speed manual transmission, and the Corvette was on its way to stardom. When equipped with the 283 fuelie engine, 4.11:1 rear axle, and the new four-speed Borg-Warner T-10 transmission, the Corvette could accelerate from 0-60 in less than six seconds, and do the quarter mile in the low 14 second range at over 100 mph. For those that wanted even more performance, Chevrolet offered two option packages. Checking RPO 579E got the buyer the fuel-injected 283 cid V8 with cold-air induction and a big tachometer on the steering wheel. There also was special race only package, coded RPO 684, which was strictly for off road (track only), and consisted of heavy-duty springs and shocks and sway bar, a positraction rear axle, quicker ratio steering and metallic brakes. 283 (4 bbl) V8 220 bhp @ 4600 rpm, 300 lb-ft @ 3000 rpm. 283 (2×4 bbl) V8 245 bhp @ 5000 rpm, 300 lb-ft @ 3800 rpm. 283 (2×4 bbl) V8 270 bhp @ 6000 rpm, 285 lb-ft @ 4200 rpm. 283 (“Fuelie” w/ auto) V8 250 bhp @ 5000 rpm, 305 lb-ft @ 3800 rpm. 283 (“Fuelie” w/ manual) V8 283 bhp @ 6200 rpm, 290 lb-ft @ 4400 rpm. 283/283: 0-60 in 5.9 seconds, 1/4 mile in 14.3 seconds @ 100 mph. Comments: The Corvette continued to improve for 1958 as the fuel injected 283 V8 now produced up to 290 bhp and the Corvette received a new body design which featured four headlights. Also new was the washboard hood which featured simulated louvers and twin decklid chrome strips. 283 (4 bbl) V8 230 bhp @ 4800 rpm, 300 lb-ft @ 3000 rpm. 283 (“Fuelie”) V8 250 bhp @ 5000 rpm, 305 lb-ft @ 3800 rpm. 283 (“Fuelie”) V8 290 bhp. @ 6200 rpm, 290 lb-ft @ 4400 rpm. Comments: The 1959 Corvette lost its simulated louvers and twin decklid chrome strips on the hood. Comments: The 1960 Corvette saw an increased use of aluminum and a new rear anti-sway bar to improve handling. Corvette production topped 10,000 units for the first time. 283 (“Fuelie”) V8 275 bhp. 283 (“Fuelie”) V8 315 bhp. Comments: The last of the straight axle Corvettes was the first to offer a Chevy 327 cid small block V8. It was offered in three forms, with the top reserved for a special race package, called “Sebring.” Due to the racing ban of 1957, Chevrolet was not allowed to support factory racing. Because of this, the “grandfather” of the Corvette, Zora Arkus-Duntoz slipped in several serious racing parts on to the Corvette options list. 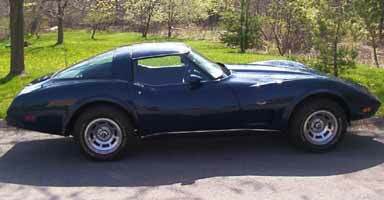 The Corvette was a true sports car, as power steering, power brakes, and air condition were not available. Performance buyers, however, could order hot “Duntov” camshafts, thermo-activated cooling fans, and aluminum-cased transmissions. Also available was a special racing package, called “Sebring.” Available options on the Sebring included 15×5.5 inch wheels (no charge), a direct-flow exhaust system (no charge), a 24-gallon fuel tank ($118.40), four-speed gearbox ($188.30), Posi-Traction rear axle ($43.05), sintered metallic brake linings ($37.70), and a heavy-duty suspension ($333.60). The most desired option was the 327 V8 “fuelie” rated at a whooping 370 bhp which cost $484.20. With a low 3,080 pound curb weight, a 327/380 equipped Corvette had a power-weight of just 8.6 lbs per horsepower, the lowest ratio ever, up to that point. This combination was good for 0-60 in just 5.9 seconds and run the quarter mile in 14.9 seconds. Exterior styling changes included de-emphasized bodyside cove sculpture and a blacked-out grille. 327 V8 250 bhp @ 4400 rpm, 350 lb-ft @ 2800 rpm. 327 V8 300 bhp @ 5000 rpm, 360 lb-ft @ 3200 rpm. 327 V8 340 bhp @ 6000 rpm, 344 lb-ft @ 4000 rpm. 327 (“fuelie”) V8 360 bhp @ 6000 rpm, 352 lb-ft @ 4000 rpm. 327/370: 0-60 in 5.9 seconds, 1/4 mile in 14.9 seconds. 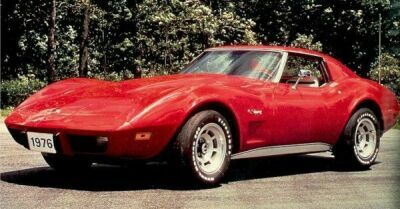 Introduction: The Second Generation (C2) Corvettes took performance to a new level, as first powerful fuel injected small block and later true race big block engines would propel them to faster and faster speeds. Comments: The second generation Corvette was launched in 1963 and saw the debut of the gorgeous Sting Ray body. A two passenger coupe body style joined the convertible for the first time and featured a split rear-window design. The Corvette featured an independent rear suspension (replacing the previous version’s straight axle), fuel-injection, and knock off wheels. It even had a racing option, the Z-06. The Z-06 was created by Zora Arkus-Duntoz as a purpose built (through non-descript) racer, although its thunder was stolen by the superior Shelby Cobra. 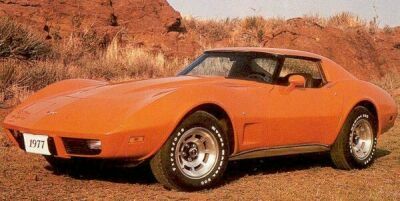 Nevertheless, the Z-06 option consisted of a fuel-injected 327 cid V8, 36.5 gallon fuel tank, heavy-duty brakes, heavy-duty suspension, and knock-off wheels. The heavy-duty brakes consisted of drums with sintered metallic linings, power assisted and backed by a dual circuit master cylinder. “Elephant ear” scoops rammed fresh air to the drums and cooling fans spun with the hub. The 36.5 gallon fuel tank (coded N03), just fit in the back of the coupe body style and helped the Corvette better compete in long distance endurance racing events, such as Daytona. 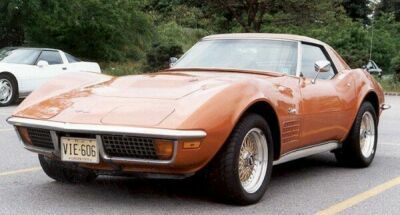 About 60 of the 199 Z-06 Corvettes had the N03, and those Corvettes included inner wheel well housings modified to fit larger-than-stock tires. The knock off wheels, which became synonymous with the 1963 split window Corvette, actually leaded due to porosity of the aluminum and poor sealing at the rims, and no more than a dozen coupes and roadsters got them. 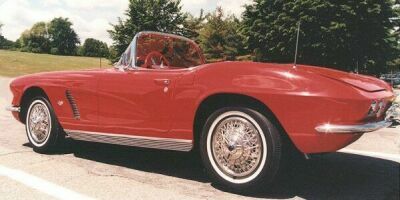 Luxury options such as power steering, air conditioning, and leather seats were available for the first time on Corvettes. L75 327 V8 300 bhp @ 5000 rpm, 360 lb-ft @ 3200 rpm. L76 327 V8 340 bhp @ 6000 rpm, 344 lb-ft @ 4000 rpm. L84 327 (“fuelie”) V8 360 bhp @ 6000 rpm, 352 lb-ft @ 4000 rpm. Comments: The 1964 Corvette featured several improvements such as higher horsepower “fuelie” engine options, a smoother ride, and better insulation. 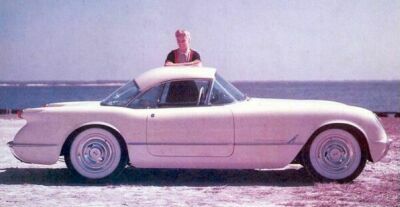 The hardtop lost its split rear-window design in favor of a more conventional single-piece rear window, because owners of 1963 Corvettes complained about rear visibility. L79 327 V8 350 bhp @ 5500 rpm, 360 lb-ft @ 3600 rpm. L76 327 V8 365 bhp @ 6200 rpm, 350 lb-ft @ 3400 rpm. L84 327 (“fuelie”) V8 375 bhp @ 6200 rpm, 350 lb-ft @ 4600 rpm. Comments: 1965 saw several changes to the Corvette. The big news was the addition of standard four-wheel disc brakes. Styling changes were at a minimum, with functional front fender louvers, new wheel covers, and a restyled grille. The hood had no depressions or trim, and thus was not interchangeable with the ’63 or ’64 Corvettes. Inside, newly styled bucket seats were offered and genuine leather seating surfaces were optional. Options few European cars could match included power steering, power brakes, power windows, air conditioning, AM-FM radio, telescopic steering column, and a wood-rimmed steering wheel. Under the hood, the Corvette offered a wide range of engines. Standard was Chevy’s tried-and-true 327 cid Turbo Fire V8 rated at 250 bhp. Next up was a 300 bhp version of the 327 and new for 1965 was the precursor to the famous LT1, a 327 rated at 350 bhp. At the top, was the most powerful carburetor 327, rated at 365 bhp. For true performance buyers, the Ram-Jet Fuel-Injected 327 made its last appearance in 1965. At $538, fuel injection was an expensive option, but it made 327 a 375 bhp stormer. It was the ultimate small block V8. But the introduction in April 1965, of the 396 cid big block MK IV V8 marked the beginning of a new era for the Corvette. Rated at 425 bhp and priced at only $292.70, the 396 V8 big block was a direct descendant of the 427 cid MK II engine that dominated NASCAR in 1963, and made the 327 “fuelie” seem superfluous in an era of cheap, high octane gasoline. A special bulging hood was included when the 396 was ordered. Interestingly, this would be the only year for the 396 V8. Although the 327 “fuelie” was still available through the 1965 model year, it was quietly dropped when the 1966 Corvettes was introduced. Introduced at the same time as the 396 were new side-mounted exhausts, a $134.50 option. 1965 was a unique and memorable year for the Corvette. It was the only year that you could buy a fuel-injected, disc-braked Sting Ray. It was the first year for the big block and side-mounted exhausts. And with prices starting at $4,106, the 1965 Corvette Sting Ray was quite a bargain. No wonder that sales reached a record 23,652 units. L78 396 V8 425 bhp @ 6400 rpm, 415 lb-ft @ 4000 rpm. 396/425: 0-60 in 5.7 seconds, 1/4 mile in 14.1 seconds @ 103 mph. Comments: The 1966 Corvette featured a new eggcrate grille and functional engine compartment cooling vents. The previous year’s 396 V8 was dropped. In its place, a new muscle Corvette was introduced, the “427” with its own funnel-shaped, power bulge on the hood. There were two of these big blocks at first. RPO L36, priced at $181, was rated at 390 bhp. RPO L72, with a $312 price tag, was rated at 425 bhp. Both engines were related to the “mystery” 427 and the production Turbo Jet 396. The 427/425 bhp Corvette convertible could hit 60 mph in just 5.7 seconds, and the quarter mile in 14 seconds. It boasted a power-to-weight ratio of just 7.7 lbs per horsepower. “427 Turbo Jet” crossed racing flag emblems appeared above the cooling vents. Three four speed gearboxes — wide ratio, close-ratio, and heavy-duty close ratio were optional. Side-mounted exhaust pipes were optional. 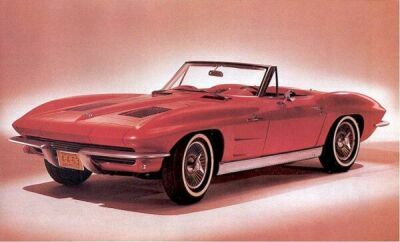 A total of 5,116 L36s and 5,258 L72s were built, therefore 38% of the 1966 Corvettes were 427s. L79 327 V8 300 bhp @ 4800 rpm, 360 lb-ft @ 3400 rpm. L36 427 V8 390 bhp @ 5400 rpm, 460 lb-ft @ 3600 rpm. L72 427 V8 425 bhp. 427/425: 0-60 in 5.7 seconds, 1/4 mile in 14 seconds. Comments: For 1967, the Corvette got additional engine cooling vents, and 427s got a different “power bulge” hood and more top horsepower. The new hood had a large, forward facing air scoop, usually with engine call-outs on both sides. The standard engine was a 327 V8 rated at 300 bhp. But for performance fans, there were four versions of the 427 available. The first version, the L36, cost just $200 more and featured a single four barrel carb, 10.25:1 compression and hydraulic lifters. It was rated at a stout 390 bhp. Next up was the L68 for $305 which featured triple two-barrel Holley carbs (a first for Corvette) and was good for 400 bhp. At the top was the L71 with triple two-barrel Holley carbs, solid lifters, special performance cams, and 11:1 compression which was conservatively rated at 435 bhp. Extremely rare (only 20 were built) was the top of the line L88 for $948 more. The L88 featured new aluminum heads, 12.5:1 compression, and a single Holley four barrel carb rated at 850 cfm that sat on an aluminum intake manifold with a special raised plenum chamber. In addition, you got a transistor ignition and Positraction differential but didn’t get a fan shroud, heater, nor defroster. Chevrolet was reluctant about revealing the engine’s true potential and officially rated at only 430 bhp, but most experts believed that it in fact developed close to 600 bhp! In all, 9,707 big-blocks were built, meaning that 42.31% of all 1967 Corvettes were 427s. Transmission choices were relatively simple. With the L36 and L68, buyers could choose between the wide-ratio ($184) or close-ratio ($184) four-speed manuals, or Powerglide automatic transmission ($194). The L71 came only with the close-ratio four-speed. Rear end gear ratios ranged from 3.08 to 4.11. Other options included side-mounted exhausts at $132, cast aluminum bolt-on wheels at $263 and detachable hardtop for the convertible for $232. L68 427 V8 400 bhp @ 5400 rpm, 460 lb-ft @ 4000 rpm. L71 427 V8 435 bhp @ 5800 rpm, 460 lb-ft @ 4000 rpm. L88 427 V8 430 bhp @ 5200 rpm, 460 lb-ft @ 4000 rpm. Introduction: The Chevrolet Corvette first appeared in 1953 as a unique American entry into the sports car market dominated by European makes. Although not a muscle car by definition, the Corvette used muscle car powertrains and has represented American performance for almost fifty years. Note: All Engine ratings before 1972 are expressed in SAE Gross figures. Engine ratings for 1972 and later are expressed in SAE Net figures. Comments: The all new 1968 Corvette was a dramatic change in appearance from previous Corvettes. The all new styling bore a striking resemblance to Chevrolet’s Mako Shark II concept car and was a bold look. The new Corvette also introduced hidden windshield wipers and removable T-tops on Coupe models. A new three speed automatic transmission replaced the previous two-speed unit. Under the hood, the Corvette gained several interesting engine options, including the 327 cid V8 L79 rated at 350 bhp, and the L89 aluminum head option for the L71. The rare L88 engine option was still available for a whopping $1,032, and just 115 were sold. Still rated at the same 430 bhp as the regular 427 engine, the wise buyers that checked off the L88 option were treated to a host of goodies such as a bubble top hood, the 427 engine with an aluminum intake and aluminum heads with a 850 CFM dual feed Holley carb. Mandatory options included an aluminum radiator, heavy duty brakes, and the Muncie M-22 transmission. Luxury options such as Power windows, power steering, and radios were not available. Corvette production hit a new record of 28,566 units. 327 V8 300 bhp @ 4800 rpm, 360 lb-ft @ 3400 rpm. L79 327 V8 350 bhp. 427/430 (L88): 1/4 mile in 13.56 seconds. Comments: The Corvette was basically carry over for 1969, though now officially called the “Stingray” (one word) The coupe outsold the convertible for the first time, and would continue to do so in all subsequent years. Engine choices were changed with a new 350 cid V8 replacing the previous 327. In addition, two Corvettes were built with the ZL1 engine (a total of 69 Camaros also received this engine). One was a canary yellow car with sidepipers and the other was a Can-Am white t-top coupe with black ZL1 stipes. Technically, the ZL-1 was a $3,010 option that consisted of an assortment of aluminum cylinder block and heads on top of the $1,032.15 L88 race option. The ZL-1 featured thicker walls and main webbing, along with dry sump lubricating provisions. The bottom end was four-bolt, with a forged steel crank and rods with 7/16 inch bolts, Spiralock washers and full floating pins. Pistons were even higher domed than the L88s, yielding a compression ratio of 12.5:1. Cylinder heads were also aluminum and featured open combustion chambers and round exhaust ports and 2.19 inch/1.88 inch valves, a configuration adopted by the L88 in mid-1969. The aluminum dual plane intake was topped by a 850 cfm Holley four-barrel (double pumper) carburetor featuring mechanical secondaries. The ZL1’s solid lifter camshaft was radical, so the engine could live in the upper revs. L46 350 V8 350 bhp @ 5800 rpm, 360 lb-ft @ 3600 rpm. ZL1: 427/430: 1/4 mile in 12.1 seconds @ 116 mph. Comments: Chevy’s new 454 V8 replaced the firebreathing 427s for 1970. But while the Chevrolet Chevelle SS received Chevy’s top engine, the 454 LS6 rated at 450 bhp, the Corvette had to make due with the 454 LS5 rated at 390 bhp. Despite rumors to the contrary, the Corvette never received the LS7 engine, an iron block/aluminum head 454 race motor rated at 465 bhp nor the LT2 454. A total of 17,316 units were sold in 1970. LT1 350 V8 370 bhp. LS5 454 V8 390 bhp. LT1: 350/370: 0-60 in 5.7 seconds, 1/4 mile in 14.2 seconds. Comments: The Corvette finally received the powerful LS6 454 engine for 1971, but it was now detuned to run on unleaded gas and was rated at 425 bhp, down 25 bhp from the 1970 Chevrolet Chevelle SS. The carryover LT1 and LS5 engines were also detuned. 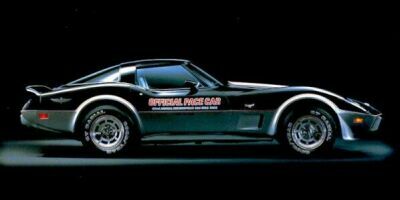 Interestingly, only 188 LS6 Corvettes were built, with 12 more appearing under RPO ZR2, the factory racing package. LT1 350 V8 330 bhp. LS5 454 V8 365 bhp. LS6 454 V8 425 bhp. Comments: Engine power ratings dropped across the board as GM ordered that all its engines be rated using the new SAE net method, which rated an engine with all accessories attached. 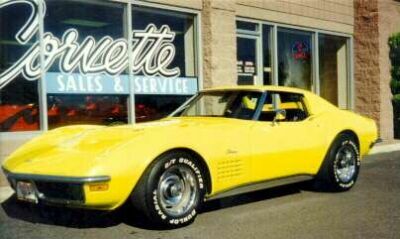 True output remained similar to 1971 and the Corvette was still quite a performer. LT1 350 V8 255 bhp. LS5 454 V8 270 bhp. 350/255: 0-60 in 6.9 seconds, 1/4 mile in 14.3 seconds. 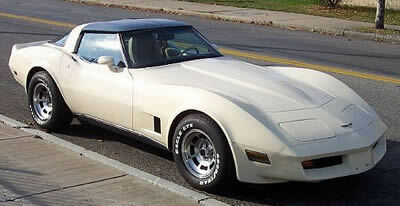 Comments: The 1973 Corvette was the fifth generation “Shark” which debuted in the years of the first energy crisis. 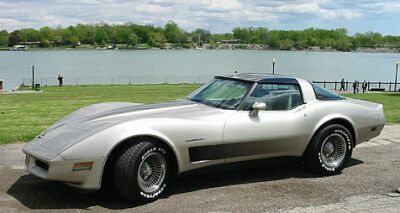 The 1973 Corvette was unique among Corvettes in combining a smooth body-colored nose with the original 1968-vintage “Kamm” tail. The front bumpers were updated to meet the new 5 mph standard, but the rear bumpers remained chrome, the last year the Corvette would use chrome bumpers. The engines were further detuned for cleaner emissions, which resulted in lower engine outputs. Generally, the styling was cleaner than previous years, with a rear hood extension to cover the windshield wipers (instead of a pop-up panel), and a fixed coupe backlight instead of a removable one. The new Corvette was also improved with standard radial tires (the first time on the Corvette), a more efficient Turbo Hydra-Matic automatic transmission option, and combined lap/shoulder belts. Of particular interest to enthusiasts was the availability of the RPO FE7 Gymkhana suspension (high-rate springs/shocks for only $7) and the similar Z07 option (with heavy-duty brakes). LT1 350 V8 250 bhp. Comments: The 1974 Corvette received a new smooth urethane body-color rear end to match the front styling. The new rear end also hid the new Federal mandated 5 mph bumpers. Bowing to increasing government regulations, 1974 would be the last year for the big block engines and true dual exhausts, among other things. Comments: Engine output hit rock bottom with the 1975 Corvettes, as big blocks were no longer available and the top 350 cid V8 was rated at just 205 bhp. Changes were few, and included the addition of small black-rubber bumper pads and electronic ignition. 1975 would be the last year for the Convertible, as falling sales and a threatened government mandated rollover standard (that never materialized), sealed its fate. L82 350 V8 205 bhp. Comments: Engine output climbed for 1976, due to higher compression ratios made possible by a newly adopted catalytic converter. A new four-spoke steering wheel was added and the rear-deck air-extractor vents were removed. L82 350 V8 210 bhp. Comments: The “Stingray” name was officially dropped for the 1977 Corvettes. Changes included revamped controls and center console, standard leather upholstery, and no-cost power steering and brakes. Comments: The Corvette celebrated its 25th Anniversary in 1978, and all Corvettes received special commemorative emblems. 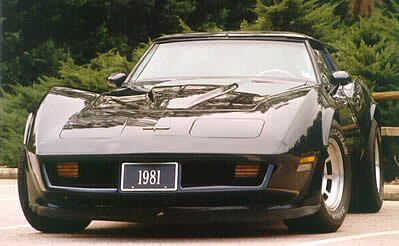 All 1978 Corvettes received a new fastback roofline with a large, wraparound backlight. A four-speed manual was reinstated as standard, and a higher-output 350 cid V8 was available, though only with the automatic transmission. But the big news for enthusiasts was the addition of two limited edition versions of the Corvette. 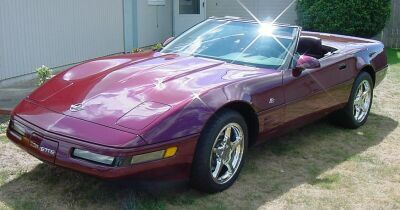 The true Anniversary editions were those Corvettes ordered with the “25th Anniversary Paint” B2Z option. It was a distinctive two-tone silver paint treatment with a silver metallic upper body color and a charcoal silver lower body color. Pin stripes accentuated the front upper profiles, wheel openings, front fender vents, hood, and rear license cavity. The optional aluminum wheels and dual sport mirrors were required. The second limited edition Corvette was the Pace Car Replica model, which commemorated the Corvettes which paced the 62nd Indy 500. The Pace Car Replica was decked out with a black upper body and silver-metallic lower body, plus the alloy wheels and fat Goodyear tires worn by the Silver Anniversary model. The Pace Car Replica also carried front and rear spoilers and the identifying “Pace Car” decals were supplied separately so the owner could apply them if desired. Upholstery choices were either silver leather or a silver leather/gray cloth combination. The seats were a new design scheduled for the 1979 Corvettes. 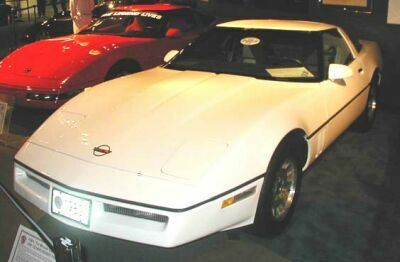 Standard equipment included power windows, electric rear window defroster, air conditioning, sport mirrors, and other features which boosted the price of the Pace Car Replica over $4,000 more than the base Corvette. Because of its announced limited availability, new Pace Car Replicas fetched upwards of $28,000 and a flood of “fake” Pace Car Replicas flooded the market, then and now. 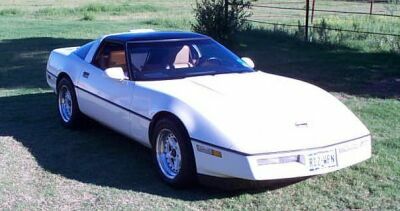 The only true clues to a real Pace Car Replica are the seats which should resemble a 1979 Corvette more than the 1978 ones, and the serial number, which should be between 900001-906502. L82 350 V8 220 bhp. Comments: The 1979 Corvette saw many optional features become standard equipment to improve its “cruising” aspect, including air conditioning, power windows, and a telescoping steering column. The front and rear spoiler package that was used on the previous year’s Pace Car was now available as an option on any Corvette. More Corvettes were built in 1979 (53,807) than in any other year, before or since. L82 350 V8 225 bhp. Comments: The 1980 Corvette was 250 lbs. lighter than the year before, mainly through the greater use of aluminum and plastic. The doors and hood were less thick, and the roof panels were less dense. New front and rear spoilers were molded into the bumper caps, which helped aerodynamics. However, the speedometer now maxed out at 85 mph (to meet Federal Regulations). 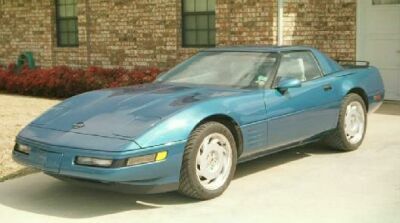 Due to strict California emission laws, a lower emission 305 V8 that was computer controlled was the base engine for Corvettes sold in California. L82 350 V8 230 bhp. Comments: There were few changes for 1981 except a few more paint choices. The sole engine was now computer controlled and could meet California emission standards, eliminating the need for a separate engine. Comments: 1982 was the last year for the 3rd Generation Corvette. In a sad statement about the decline of performance, all Corvettes came with automatic transmissions. A special Collector Edition Corvette was sold with silver paint with a gold base and a matching interior. This was the first year for the new Cross Fire fuel injection system. 350 V8 200 bhp @ 4200 rpm, 285 lb-ft @ 2800 rpm. Introduction: Therefore, when the new Fourth Generation Corvette came out for the 1984 model year, the pent-up demand along with innovative exterior and interior design pushed its sales to new heights. Despite the delayed start, the Fourth Generation would last the longest – a whopping 12 years. Comments: Due to production problems with the 4th Generation re-design, there was no official 1983 Corvette sold to the general public. However, 44 – 47 production mules were built and 1 survives today at the Corvette Museum. Comments: The 1984 Corvette was the first year of the Fourth Generation Corvette and debuted in April 1983. 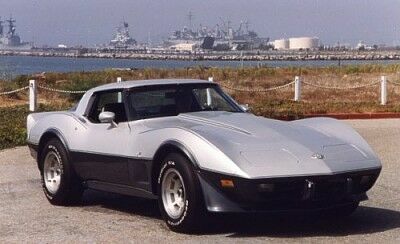 Its new design, digital instrumentation, and new interior was a hit with buyers, and the Corvette sold over double the number of 1982 Corvettes. The C4 featured 16×8.5 wheels with P255/50VR-16 tires and the choice of either a four-speed automatic or four-speed manual transmission. 350 V8 205 bhp @ 4300 rpm, 290 lb-ft @ 2800 rpm. Comments: 1985 was the first year that no new colors were offered on the Corvette. The only changes were straight tailpipes and a new “Tuned Port Injection” version of the venerable 350 V8 which boosted power to 230 bhp. This new found power was advertised with “Tuned Port Injection” badges on the front fenders. 350 V8 230 bhp, 330 lb-ft @ 3200 rpm. Comments: 1986 saw the return of the convertible. A Yellow Corvette Convertible was chosen to pace the 1986 Indianapolis 500, and to commemorate, all convertibles came with stick-on Pace Car decals. This was also the first year for the center high-mounted brake stoplight (CHMSL), the anti-lock braking system (ABS), and a VATS key coded anti-theft system. Comments: The convertible becomes more popular, increasing to over a third of total Corvette sales. A very limited edition Callaway Twin-Turbo Corvette was available through the dealer which featured a Twin Turbo version of the 350 V8 rated at a stout 345 bhp and capable of a 177.9 mph top speed. 350 V8 240 bhp @ 4000 rpm, 345 lb-ft @ 3200 rpm. Comments: Corvette sales began to slip in 1988, despite a special 35th anniversary Corvette which was a white coupe with a black top. New wheel designs and a more efficient air conditioning system also debut. The 350 in the coupe was rated at 245 bhp, while those in the convertible were rated at 240 bhp. Coupe: 350 V8 245 bhp @ 4300 rpm, 345 lb-ft @ 3200 rpm. Convertible: 350 V8 240 bhp @ 4000 rpm, 345 lb-ft @ 3200 rpm. Comments: The Corvette received a new 6-speed manual transmission, as well as air bags. Comments: The Corvette received a new 6-speed manual transmission, as well as air bags. The standard 350 V8 gained 5 bhp due to a slight increase in the compression ratio. However, the big news was the introduction of the “King of the Hill” Corvette: the ZR-1 (RPO ZR1). The ZR-1’s main feature was the LT5, a highly modified version of the 350 V8, developed with the help of Lotus, and built by Mercury Marine. The LT5 featured a very modern dual overhead cam, 32 valve design which put out a whopping 375 bhp. The ZR-1 also featured a distinctively wider back end and square tail lamps. The main problem was price. The ZR-1 cost nearly $59,000 (and many sold for much more than MSRP), compared to the base coupe priced at $32,000. Coupe: 350 V8 250 bhp @ 4400 rpm, 350 lb-ft @ 3200 rpm. Convertible: 350 V8 245 bhp @ 4000 rpm, 345 lb-ft @ 3200 rpm. ZR-1: 350 V8 375 bhp @ 6000 rpm, 370 lb-ft @ 4800 rpm. 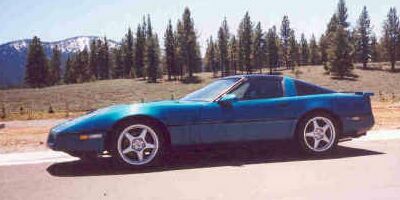 Comments: All 1991 Corvettes received new side panel louvers, wrap around parking/fog lamps, wider body side moldings, and the re-styled rear end (with square tail lights) formerly exclusive to the ZR-1. A new heavy duty suspension (RPO Z07) was available on Coupes which allowed the driver to adjust the Corvette’s suspension from firm to very firm. 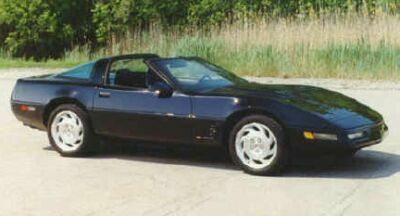 To help differentiate the ZR-1, its CHMSL remained on the roof, while lesser Corvettes had it integrated into the rear fascia. 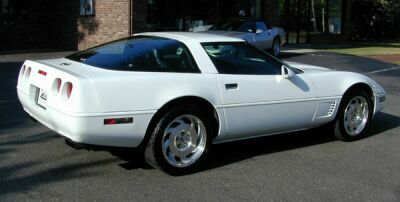 ZR-1’s also had unique doors, and wider rear body panels to fit the wider tires. Most civilians couldn’t tell the ZR-1’s apart from lesser Corvettes, which greatly hurt the ZR-1 mystique. 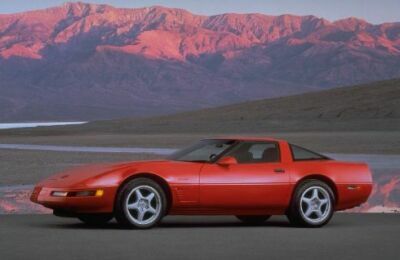 1991 would be the last year of the Callaway Twin-Turbo Corvettes. Comments: The 1992 Corvette saw a significant boost in performance with the introduction of the second generation LT1 small block 350 V8. Named after the the original LT-1 (note the dash) engine of 1970, the last Chevy small block V8 to generate over 300 bhp. The new LT1’s 300 bhp rating was an increase of 55 bhp over the prior year, and this extra power was applied to the road through a new standard Acceleration Slip Regulation (ASR) system which used engine spark retardation, throttle close down, and brake intervention to limit wheelspin while accelerating, and wide Goodyear GS-C asymmetrical tires. The ZR-1 model continued, now with a ZR-1 badge on the sides of the clam shell hood. 350 V8 300 bhp @ 5000 rpm, 330 lb-ft @ 4000 rpm. Comments: The ZR-1 finally got some distance between it and the base Corvette with an increase in its LT5 engine to a whopping 405 bhp. This was due mainly to modifications to the cylinder heads and valve train. Other changes included four-bolt main bearings, a Mobil 1 synthetic oil requirement, platinum-tipped spark plugs, and an electrical, linear exhaust gas re-circulation (EGR) system for improved emission control. 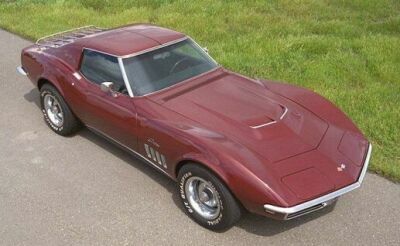 A special 40th anniversary package (RPO Z25) was available on all Corvettes and featured a Ruby Red metallic exterior, Ruby Red leather sports seats, a power driver seat, and special wheel center trim and emblems. All Corvettes with leather interiors had “40th Anniversary” embroidery in the headrests. A Passive Keyless Entry system was now standard on all Corvettes which would unlock the doors when the owner approached the car. Revisions to the LT1’s camshaft exhaust lobe profile bumped up torque by 10 lb-ft. The base Corvette’s front wheels decreased in size from 17×9.5 to 17×8.5 and tire size decreased from P275/40ZR17 to P255/45ZR17. However, rear tire size increased from P275/40ZR17 to P285/40ZR17. Corvettes with the RPO Z07 option received 17×9.5 wheels with P275/40ZR17 tires front and back. ZR-1: 350 V8 405 bhp @ 5800 rpm, 385 lb-ft @ 4800 rpm. Comments: All 1994 Corvettes received some interior changes, with the addition of a new single-piece instrument panel, a front passenger air bag, and new door panels. Both the standard and optional Sports seats were restyled and leather seats became standard. The base LT1 engine received several refinements, including a new sequential lull injection system which improved response, idle quality, driveability, and emissions, and a new more powerful ignition system, but there was no change to its 300 bhp rating. The standard 4-speed automatic transmission was redesigned with electronic controls for improved shift quality and rpm shift-point consistency. Convertibles finally received a glass rear window with an in-glass defogger. Run-flat tires were introduced as an option. Comments: 1995 marked the last year for the ZR-1. 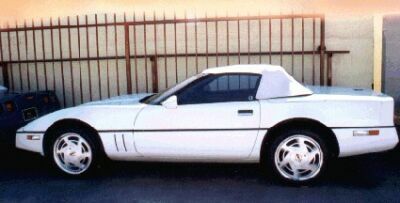 All Corvettes featured a revised gill panel design and a Corvette was once again the pace car for the 1995 Indianapolis 500 and a special Replica version was sold. All Corvettes received the larger brakes and Anti-Lock Braking system standard with the Z07 and ZR-1 performance options. Comments: With the ZR-1 gone, the Corvette features two new special editions, the Grand Sport and the Collector Edition. The new optional LT4 engine is introduced, and is standard on the Grand Sport. This would be the last year of the Fourth Generation Corvette.